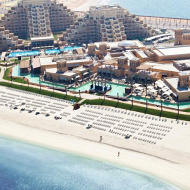 One of our favourite UAE beach resorts, the fabulous Rixos Bab Al Bahr offers high standards on a great beach, just an hour from Dubai airport - perfect for relaxation and sightseeing in equal measure. Spa, sports and sunshine form the backbone to the unforgettable Rixos Bab Al Bahr hotel in Ras Al Khaimah which has a glorious white sand beach location overlooking the gorgeous blues of the Arabian Gulf. Located on the pristine white sands of Al Marjan Island, around 1-hour 30-min drive from Ras Al Khaimah city centre. Dubai City is around 1-hours drive away. Transfer time from Dubai International Airport: 50 min. 650 rooms and suites, all with air-conditioning, LED satellite TV, payable WiFi Internet access, safety deposit box, writing desk, armchair, mini-bar (complimentary daily refills) and bathroom with rain shower and hairdryer. Classic Rooms with garden views and twin beds, sleeping max 2 adults and 1 child. Deluxe Rooms with views of the ocean or gardens, sleeping max 3 adults or 2 adults and 2 children (1st child between 3-5 years of age; 2nd child between 6-11 years of age). Premium Rooms with balcony or terrace, views of the ocean or gardens and are larger than the Deluxe Rooms, sleeping max 3 adults or 2 adults and 2 children (1st child between 3-5 years of age; 2nd child between 6-11 years of age). Family Suites with views of the ocean or gardens are larger than Premium Rooms and have 2 bedrooms and 2 bathrooms, sleeping max 4 adults and 2 children (1st child between 3-5 years of age; 2nd child between 6-11 years of age). Junior Suites contain 2 bedrooms, 3 bathrooms and 1 sitting room, sleeping max 4 adults and 2 children (1st child between 3-5 years of age; 2nd child between 6-11 years of age). Rixos Bab Al Bahr also boasts a fabulous array of restaurant options which will take you around the world and back within some truly lavish settings. This really is an excellent chance to dip your toes into the warm waters of Ras Al Khaimah and thanks to daily activities, kids' clubs and indoor/outdoor playgrounds, your whole family will get to experience the very best in Arabian hospitality. Adults aren't left out when it comes to entertainment either and you'll be treated to an eclectic choice of acrobatic, operatic and musical performances with beach parties, cocktail bars and the Inferno night club taking you into the wee small hours. Advanced reservation is required for à la carte restaurants and it is subject to availability. Al la carte restaurants operate on rotation basis, not all outlets are available on same day and require prior table reservation. Children below 12 and not permitted at Meat point restaurant. Selected restaurants incur a surcharge.